Long plastic sleepers are stuck to the asphalt like oversized Band-Aids. They are there for one reason and one reason only: to wreak as much havoc as possible on any car that crosses them. Unperturbed, the driver steers his blue compact MPV onto this special shake and vibration track. One of the passengers in the back clutches the handle above the window as the minivan crosses the bumps at full speed. But from inside the car, they're barely noticeable. “Impressive!” he gasps, releasing his grip. Sven Greger, the man behind the wheel, chuckles with satisfaction. He's a ZF research engineer who works on the basic development of our semi-active and active chassis components. Greger is used to passengers – many of them buyers or other research engineers from international automotive manufacturers – reacting this way on the proving ground. “Our sMOTION fully active chassis system introduces new degrees of freedom to counteract vehicle body movement,” he says, “We can give each wheel its own active countermovement to prevent driving situations from exciting the car body.” But along with greater comfort, sMOTION significantly improves dynamics and safety compared to current systems. Used in conjunction with cameras, the chassis system can identify the road condition, for example by anticipating bumps or potholes, and change its settings accordingly. sMOTION can actively pull up or push down the wheels. A damping system has to deal with a lot of situations. Uneven tracks inevitably lead to direct impact, which is cushioned by the suspension. If a wheel rolls over an obstacle, it lifts, compressing a spring between the steering knuckle and the car body. Then the spring decompresses. The damper's job is to attenuate the resulting vibration as quickly as possible. Aside from direct impact, vehicles have to contend with motive forces, braking forces and centrifugal forces. These forces associated with driving dynamics can prompt the car body to move in the direction of three spatial axes (see diagram below). 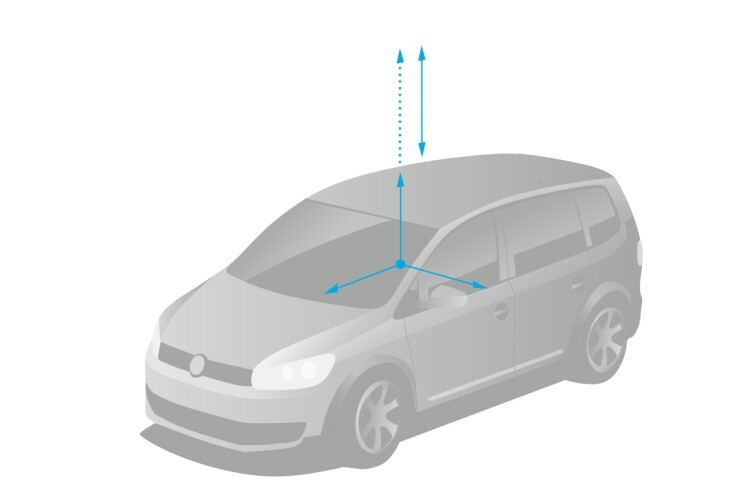 The challenge lies in the fact that different driving situations each demand a specific damping force. Minimizing body movement on curves requires high damping force. Driving over slightly uneven surfaces only requires a little. And safe contact between the tires and the ground requires moderate damping force. “A conventional damper can only ever reach a compromise between sporty and comfortable, albeit a good compromise,” says Dr. Christoph Elbers, Vice President Car Chassis Technology Development at ZF. Vertical axis: Lifting and lowering is the up and down movement caused by uneven road surfaces. Transverse axis: Pitching is when the vehicle dips (when decelerating) or rears up (when accelerating). Longitudinal axis: Rolling refers to the side tilt caused by cornering. 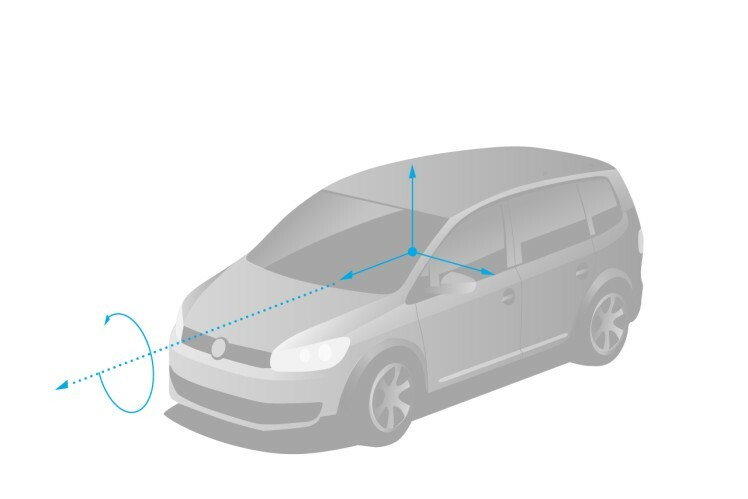 Until now, vehicle body excitation was tolerated or even desirable to a certain degree so as to give drivers perceptible feedback on conditions. But in highly automated or autonomous vehicles, all the occupants become passengers. And in that scenario, every vibration, impact, roll or pitch simply stops people from reading or working. This causes dispositions known as motion sickness, making these activities impossible,” says Dr. Elbers. “This effect is amplified by innovative seat arrangements in which driver and passengers may no longer have a view in the direction of travel.” A remedy can only be found in an active chassis. sMOTION is a ZF solution for the future that is already improving driving comfort today. Practically undisturbed by the driving process, passengers can spend their travel time working or relaxing. 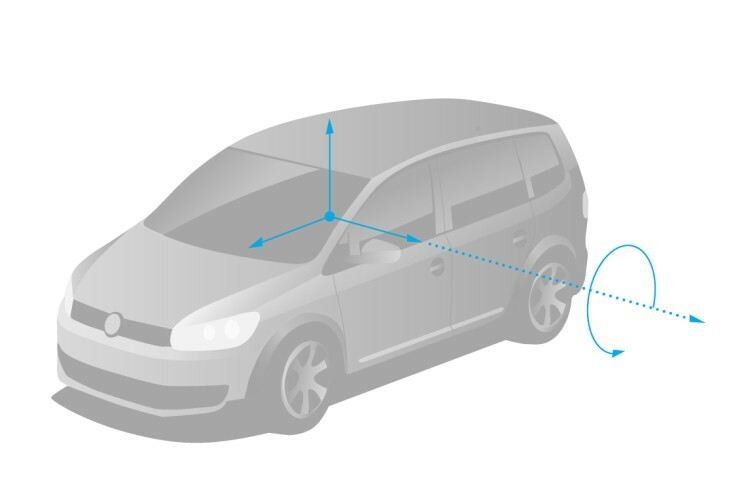 sMOTION can actively adjust movements occurring at a frequency of up to five Hertz – the equivalent of 0.2 seconds of vibration. In our test vehicle, these adjustments are made by a 2.5 kW actuator on each wheel. It's an electric pump that increases the oil pressure either above or below the damper piston and therefore actively moves it. For high-frequency excitations– such as manhole covers, cross joints, rough asphalt or gravel – the sMOTION damper has a bypass that reverts to the CDC solenoid valves. of all four 2.5-kilowatt actuators in the sMOTION test vehicle. Dr Achim Thomä, technical project manager for sMOTION, found himself and his team confronted with an unusual challenge. How could they convey the system's effectiveness if it stopped excitation so unobtrusively that passengers could barely feel a thing? The solution was simple. For demonstration purposes, Sven Greger now uses a tablet to control the dampers on a stationary vehicle: individually, in pairs, or all four at once. As he taps the screen, the van lifts and lowers, pitches, rolls and shakes like a rodeo horse, at which point the engineers in the seats have every reason to cling to the handles despite the fact the car is not going anywhere! In a nutshell: Thanks to the fully-active sMOTION damping system, driving becomes not only more comfortable but also more dynamic and safer. The challenge: different driving situations each demand a specific damping force. Minimizing body movement in curves requires a high damping force, for example. However, driving over slightly uneven surfaces requires only a little. And maintaining safe contact between the tires and the ground requires a moderate damping force. Used in conjunction with cameras, the chassis system can identify the road conditions by anticipating bumps or potholes, for example, and change its settings accordingly. Thus sMOTION also contributes to highly automated driving.